MUFE's Artisan Brush Collection has been quite well-received, with some brushes already sold out following its first launch in Singapore. 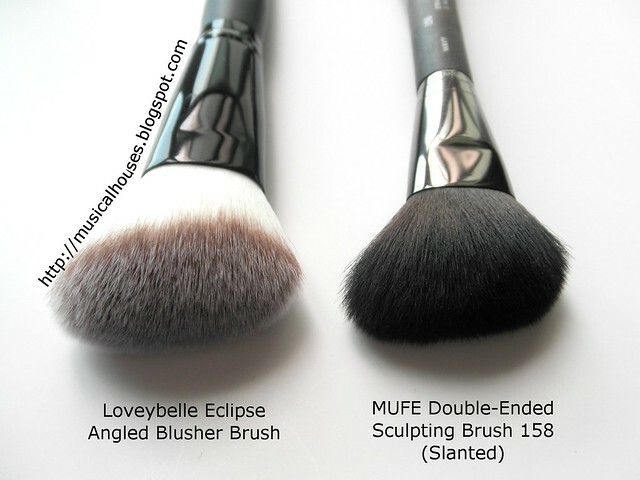 I know I've blogged about two of the brushes, the MUFE Buffer Blush Brush #152 and Medium Highlighter Brush #154 before, but I thought since I've gotten more brushes since then, I thought I'd do a quick comparison between those brushes I have and existing brushes from other brands. 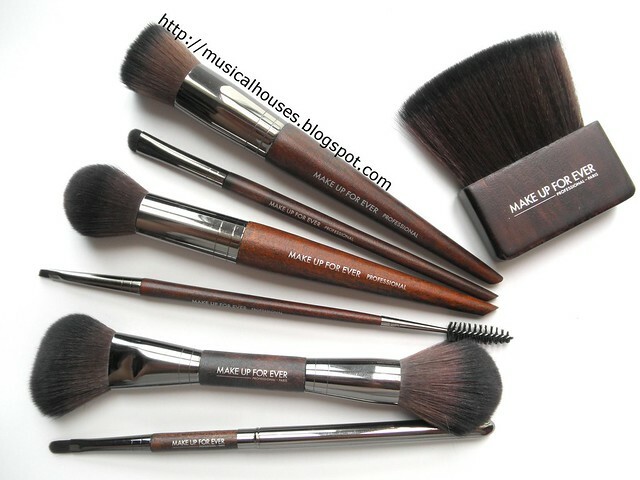 MUFE Artisan Brush Collection: Proving to be very popular! 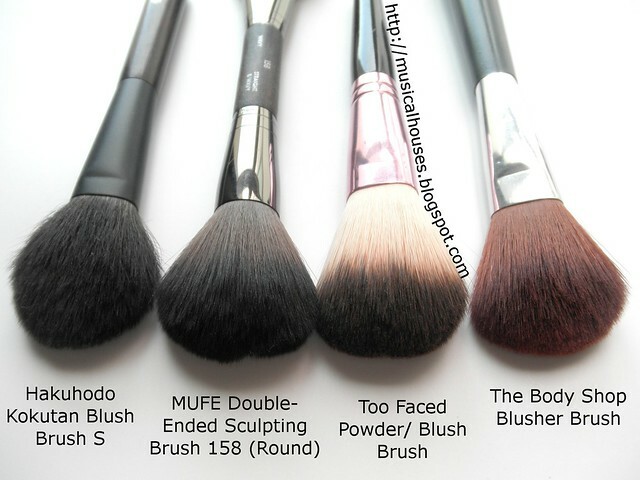 The brushes I have, in addition to the Buffer Blush Brush #152 and Medium Highlighter Brush #154, are the Lip Brush with Cap #304, the Double-Ended Sculpting Brush #158, the Round Shader Brush Small #210, the Body Kabuki #414, and the Double-Ended Eyelash and Eyebrow Brush #274. My little collection of MUFE brushes. So without further ado, let's start with the comparisons! 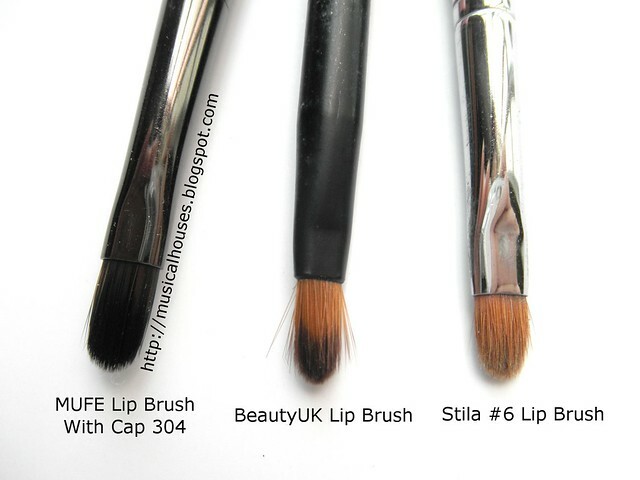 First, the Lip Brush with Cap #304. When I first got it, I was like, "Pfft, another lip brush - how special can this be?" But when I pulled out my other lip brushes, I saw the difference. The MUFE and the Stila brushes were shaped flat, like a paddle, while the BeautyUK one was more rounded and domed in shape. I prefer the paddle-shaped flat ones as the flat surface is easier for application, so although it doesn't matter that much, there is a slight preference. Between the Stila and MUFE brushes, I don't have very much preference, but to me, both the MUFE and Stila brushes are better than the BeautyUK one (although to be fair, this is reflected in the price - I got the BeautyUK one on sale for under £2). The Bottom Line: A little spendy for a lip brush, but of really good quality. Next, the Double-Ended Sculpting Brush #158. This is probably my favourite blush brush, because you can apply either apply a greater or lesser amount of product on your face depending on which head you use. The slanted head has bristles that are packed together more tightly and shorter, so it packs on more colour. The rounded head, on the other end, has longer and sparser bristles that give a more diffuse application. Depending on your preferences, you can either use just one of the heads, or you can use the denser slanted head to apply your blush or contour colour, and the more diffuse rounded head to blend it out. The rounded head is somewhat similar to a few other brushes I have lying around, although none are exact dupes. The Hakuhodo Kokutan Blush Brush S (reviewed before) is a lot smaller and less dense, while the Too Faced Powder/Blush Brush is of a similar size, but denser, and with slightly coarser bristles. 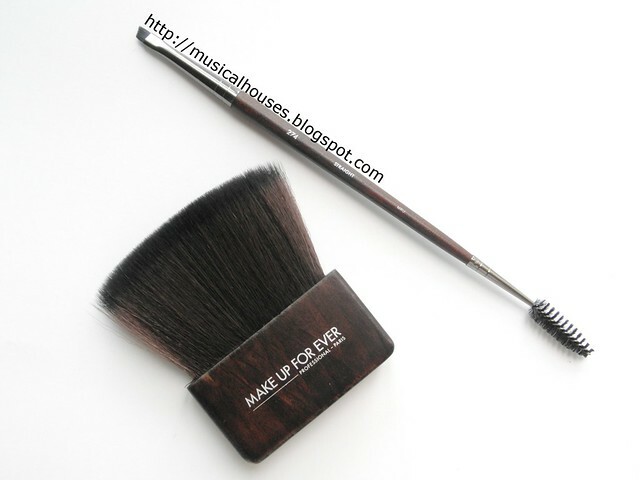 The Body Shop Blusher Brush is of a similar shape, but just a tad smaller (it's smaller than the Too Faced Powder/Blush Brush), and also with sparser bristles. I'm kind of a blush hoor (as you can tell from this Instagram pic) so I enjoy trying out different applications with different brushes. It's just part of the fun. But I suppose depending on your preferences, if you prefer something with a smaller brush head to fit better into the contours of your cheek, then the Hakuhodo or Body Shop one works best. 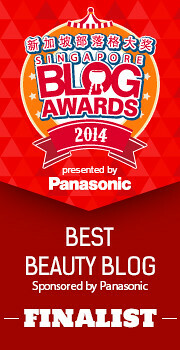 If soft bristles are what you are looking for, then all are good, but the Hakuhodo and MUFE ones are best. The slanted ended the #158 brush doesn't havae too many comparisons - I realized I don't actually own a lot of slanted brushes. 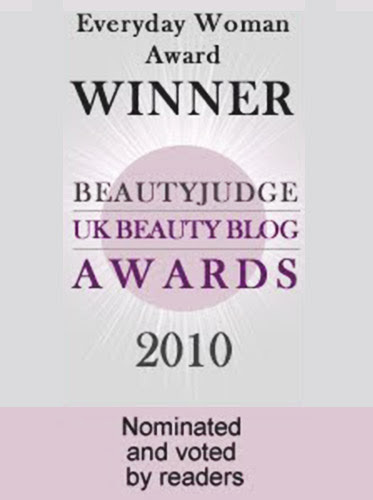 The one I have is from my recently-reviewed Loveybelle Angled Blusher Brush, which was part of the Loveybelle Eclipse Set, reviewed here. 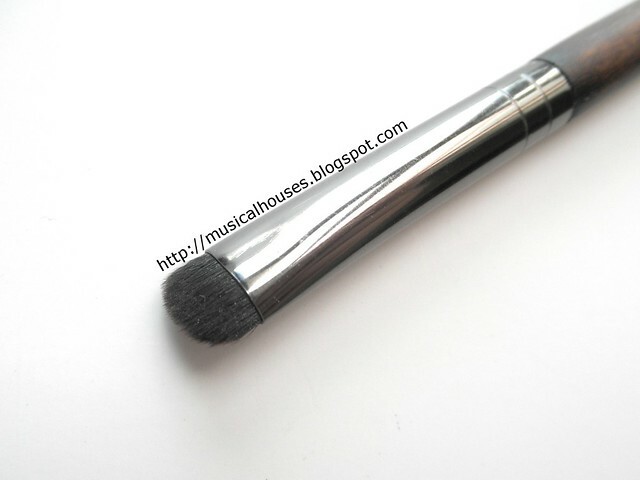 Quality-wise, the MUFE has softer, finer bristles - but it also costs a lot more. The Loveybelle brush, however, has a larger brush head, as well as less densely-packed bristles, so it does give a more diffuse application. 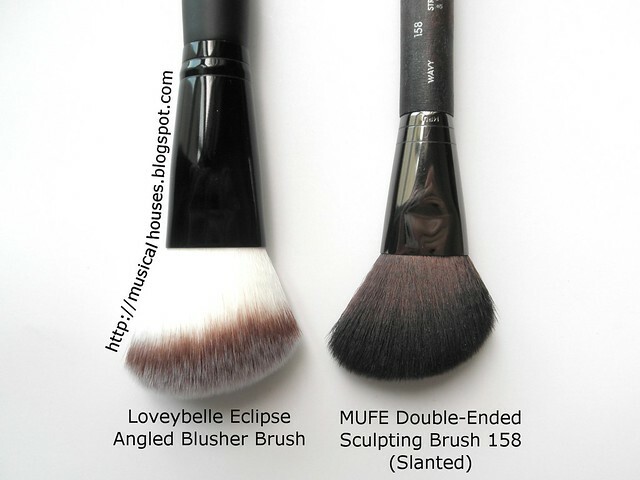 I tend to use my Loveybelle Angled Brush Blush for blending as well as application, but I don't use the slanted head of my MUFE #158 ontour Brush for blending - the bristles are just too packed together to do that. I like both and use them for different purposes, so I think I'm totally justified in owning both, but I suppose whichever you prefer will depend on what you want to use your brush for. The Double-Ended Sculpting Brush #158 is quite possibly my favourite MUFE brush out of the lot of them, but much as I love it, I have one tiny gripe with it - I have no idea how to store my double-ended brushes! Right now they're just laying flat on my table, mocking me for my lack of storage creativity. I'll think up of something eventually though, like probably just getting a tray for them to lie on. The Bottom Line: Good multi-tasking cheek brush that can be used to apply blush, contour, bronzer, and so on. The next brush, the Round Shader Brush Small #210. I've never actually owned a brush like this, but ever since I got it, I've been wondering how I've been living without it! This is a dense shader brush, with very short, tightly-packed bristles into a small space. So it's great for all sorts of nifty things - doing a cut crease, smudging or smoking eyeshadow out along your lashline, smudging eyeshadow along your eyeliner, and all the little bits like this. If you have small eyes like me, this also offers great precision in eyeshadow placement. It's probably not supposed to be used this way, but on occasion, I use it for smudging out a very dark colour right at the outer V of my eye. It helps to blend, while not getting the shadow everywhere. 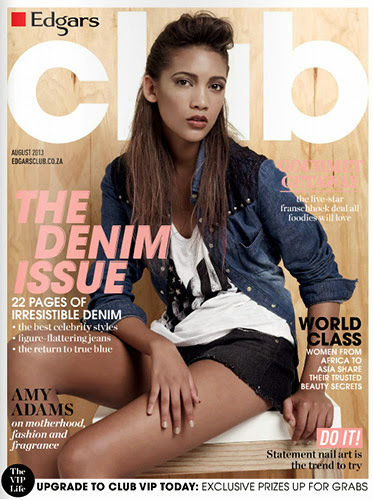 This is for sure one of my favourites in the group as well. The Bottom Line: Very useful brush for doing detail work, or for smoking out eyeshadow in a controlled manner. 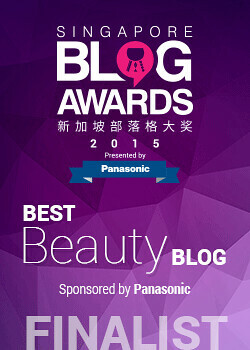 The last two brushes, are the the Body Kabuki #414, and the Double-Ended Eyelash and Eyebrow Brush #274. 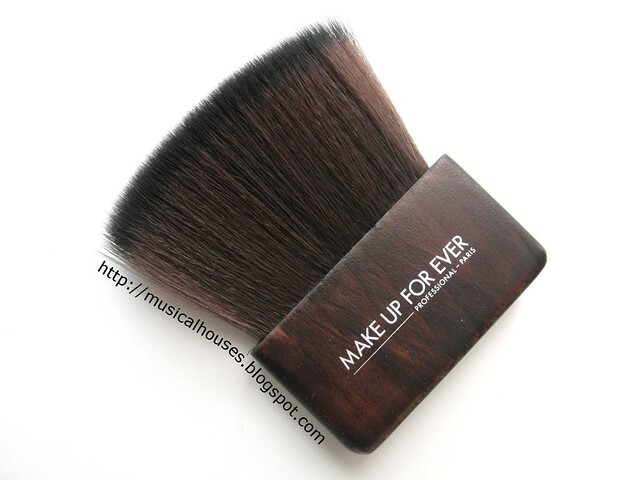 To be honest, these are the least-used in my stash of MUFE brushes. The Body Kabuki is billed as an "artistic" brush, but is actually shaped after traditional Japanese brushes. It seems in particular to be modeled after the Japanese Itahake brush used to do Geisha/Maiko makeup, and the brush was used for applying the white base on face and body. Anyway, the Body Kabuki can be used that way, too, but as far as modern face makeup goes, I find it best for probably dusting loose powder lightly over the face - like a finishing powder, for example. The short handle (which you hold in your palm rather than with your fingers like normal brushes) does take a couple of tries to feel comfortable, but its large size means it is also fairly efficient at covering a good amount of space with a few strokes. The Bottom Line: Although not a necessity, this unusual brush can be surprisingly practical, but it might take some getting used to. Best for dusting powder lightly over a wide area. The Double-Ended Eyelash and Eyebrow Brush #274, on the other hand, is perhaps best used on someone who needs brow styling everyday. I kinda have bushman brows, so if my brows are already decently groomed then I don't need to do anything. But I suppose for those with a more involved routine which involves putting on a product and combing it through your brows, then this is a useful one to have. I thought two ends are combined together quite practically too - there's a slanted end that can be used for applying brow powder (or other brow products), and a spoolie end that brushes the products into your hair. The Bottom Line: Again, a tad spendy for such a basic brush, but of good quality, and useful to have. All in all, I think the brushes, although expensive, are of good quality, with very soft bristles, and a good variety of shapes and sizes for anyone's needs. I've said it before, but one of the things I really like about the brushes is the attention to detail - even simple things like a lip brush are so well-done. If you've got the budget for them, they're worth checking out for sure. 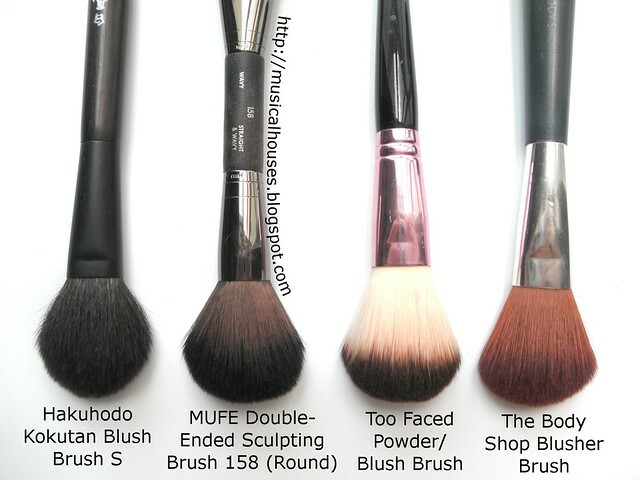 I really want to try these MUFE brushes! I got the MUFE 274 brush today and ran my bristles thru the hairs and looking thru my magnified lighted mirror, some powder came flying out! Did I buy a used one or do they coat it with powder before putting it into the plastic sleeves? It was from Sephora. What do you think? I do not want a used brush..
@Anonymous: That's weird, I've never had a brush that did that! Mine came out of the plastic sleeve without any residue on them. Hope this helps!